Since I was given Lidia Bastianich’s Lidia’s Italian Table as a wedding gift more than a decade ago, I have been flirting with her Blueberry-Apricot Frangipane Tart every so soften. Yet I never made it because either I did not have fresh blueberries and apricots at the same time, or no almond flour at hand, or not enough time, or all of the above. Today was finally the day, thanks to an extended trip to the blueberry patch yesterday and the last apricots from County Line Orchard, my favorite source for locally grown fruit. As I was lining up all the ingredients, I started revolting. One whole stick butter for the filling, in addition to the stick already required for the crust… that is too much butter for my taste in a tart where fresh fruit should be the star. So I concocted an alternative batter, substituting the butter with milk and using confectioners’ sugar instead of sugar to make it smoother. I also separated the eggs and beat the whites stiff for a fluffier consistency. Finally, since I did not have ½ cup apricot jam for the glaze (since I make our own jam, I try to avoid buying any), I made my own using two extra apricots. If you have great expectations in a book or a movie, and then it turns out not to be what you expected, you are more or less stuck. The great thing with recipes is that you can tweak and fit them to your taste so you are still happy and satisfied at the end! 1. Put the sugar and the lemon zest in the food processor and process until the lemon zest if finely chopped (doing this infuses the sugar with the lemon flavor). Add all the flour, salt, baking powder, butter and egg yolk and process until the dough starts holding together and detaches form the sides of the food processor bowl. Add 1 tablespoon ice water and pulse until the dough almost holds completely together. Remove it from the bowl, picking up all the crumbs, and gently press it together to a compact ball. Place in a container with a lid and refrigerate for 1 hour. 2. In the meantime make the apricot glaze. Puree the apricots with the water until smooth. Mix in a small saucepan with the sugar and honey and cook over low heat until tick and sticky, stirring often to prevent scorching. Set aside to cool. 3. Remove the dough from the refrigerator. Butter and flour a 10-inch cake pan. Roll out the dough between two large sheets of wax paper to fit the bottom of the pan plus 1 inch rim all around. Lift the top wax paper, flip the dough over and fit it into the pan. Even out the rim (if you are a bit short in some spots, patching is OK, this won’t be visible later). 4. Prick the crust with a fork several times and place in the freezer for 10 minutes. Preheat the oven to 350 degrees F.
5. In a bowl mix the almond flour and the confectioners’ sugar. Separate the eggs. Add the yolks to the batter together with the milk. Beat until smooth. In another bowl beat the egg whiles until stiff. Fold them into the almond batter. 6. Remove the cake pan from the freezer. 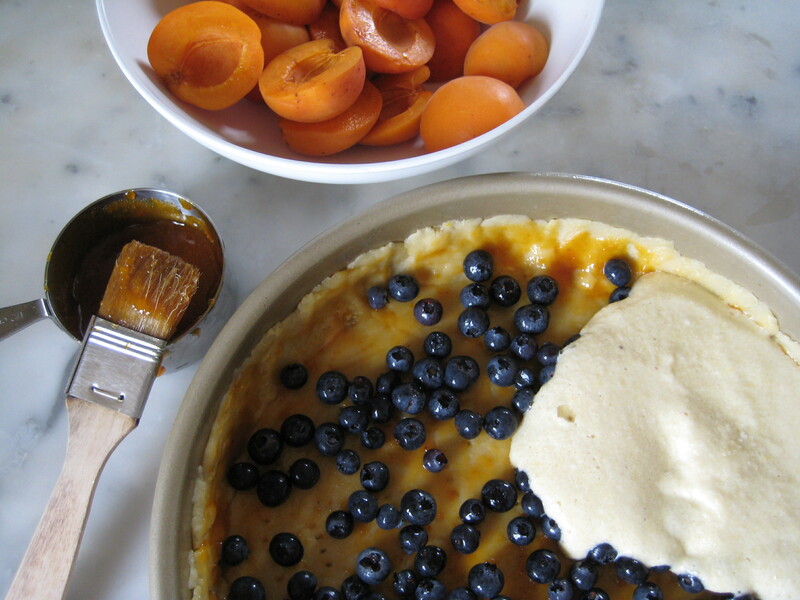 Using a pastry brush evenly coat the bottom and the sides of the crust with apricot glaze. Scatter the blueberries on top. 7. Gently spread the almond batter over the blueberries, taking care not to lift them up, and even the top with a spatula. 8. Arrange the apricot halves on top with their cut sides down, starting with a circle all around, then forming additional smaller circles. 9. Bake in the preheated oven for 40 to 45 minutes, until the top is light golden brown and set. Remove from the oven and let cool for 5 minutes. 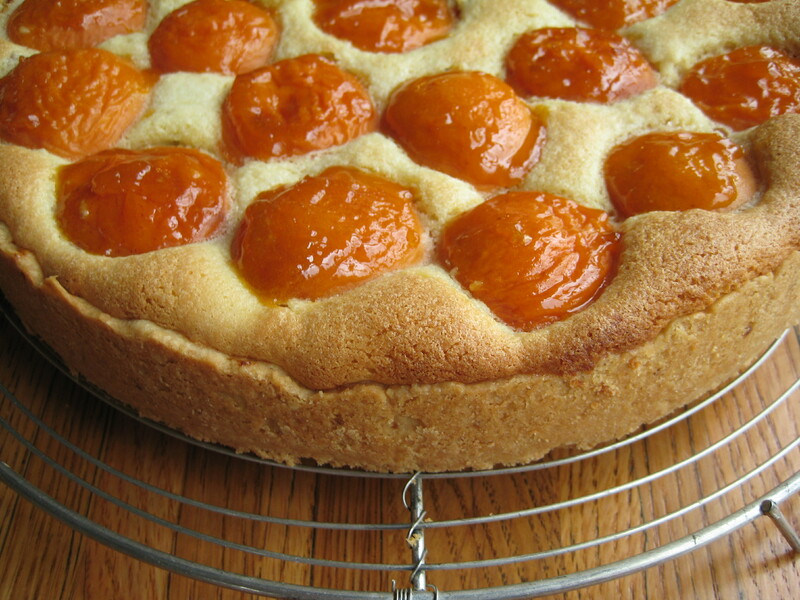 Coat the apricots with the remaining glaze and cool completely. Looks delicious – and great tip on reducing the fat content!